The planned meeting spot was the 7-11 store at Poway & Garden Road. I got up extra early to try to retake the KOM segment Keith Sherwood created a few weeks ago. We both have had it twice now. It is the 12+ miles from the end of Carmel Mountain Road (right by my neighborhood) straight to PQ Blvd and Poway Road to the top where it ends at Highway 67–one long road that changes names 3X. Early Sunday morning the traffic was low and I made all the lights to start the Poway Grade Climb. I was on pace to eke out a new time. I gave it a good effort and got to the top in just under 56 minutes before turning around to descend back to the 7-11 store. My ride shows I earned a KOM but I remembered that Keith’s time when he took it back from me was under 55 minutes. He is the real KOM. At the store Bob P and John M were already waiting. Jeff Cresap and Tony rode up as did Bryan and Monica. We had a good group of 7 riders ready for a nice relaxing ride. Cresap volunteered to host and set the route for SPP & Mussey. We all climbed together up SPP and over around Mount Woodson. Bob P did most of the pulling with Tony assisting ably when necessary. We went down Mussey but Tony, John and Jeff C pulled away from the rest of us, must have forgotten it was a recovery ride. Bob P had to turn around halfway down Mussey so we were down to 6 riders. I took a group photo at the bottom and we climbed back up. I decided to turn down HVR while the group went out on Dye Road before coming to HVR. I pushed my pace and was riding fast as I crested the start of the HVR descent. Strava says I was going 41.2 mph around the first turn to the left. I took the next corner to the right at 40 mph and a little wider than usual–big mistake. I hit a hole there and went toward the S curves just past the gate at Eagles Crest Road. My rear wheel started to slide to the left, then to the right as I tried to slow through braking mostly on the front. You guys all know my biking handling skills are not quite at the level of Peter Sagan so I was starting to get very worried as my bike was heading toward the left and the upcoming curve. Strava had me now at 34 mph when I laid the bike down to the right, slide across the rest of the road and hit the dirt wall to the left. I pretty quickly got up to move myself over to the right side of the road. I badly tore the right side of my riding shorts and the right arm warmer is trashed too. I was bleeding some from my hand cuts, covered in dirt dust but was otherwise in one piece. I assumed I got a pinch flat and carried my bike down the hill a bit to get to the driveway so I could replace my tube. Unfortunately I had a massive sidewall blowout of my rear tire so I was going nowhere. I eventually flagged down a pick-up truck. He had a MTB bike in the back and was heading to Lake Hodges trails–good start towards home. This is when Bryan & Tony flew by, followed quickly by Cresap, then John and Monica. I got John’s attention so he slowed, stopped and climbed back up to the pick-up. I informed John of my mechanical issue and that I would like a ride from Lake Hodges when he got back to his house. The pick-up drove me past the pedestrian bridge and up the hill to park his truck. I stayed at his truck until I found two nice MTB riders willing to take me home. 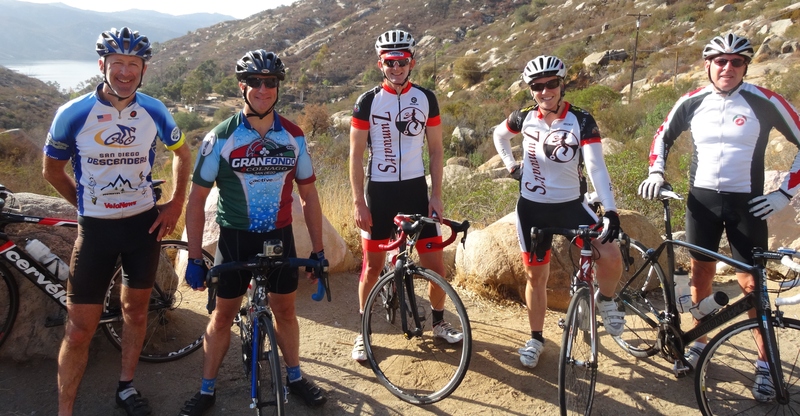 Ron & Jim live in Poway and they asked me if I rode with the Descender when I mentioned I ride with a local riding club. I invited them out to ride sometime. When I got home, I called John M to have him abort his picking me up and I did a bike & body assessment. The trusty stead is now at the Trek store (after a little clean up, of course) to get new tape on the handle bars–right side all torn off. They will replace the broken spoke on the rear wheel (not sure if this was a result of the hole or the fall) and try to fix the scraps along the side of the wheel–definitely a result of the fall. The seat took another hit and I fell on the right side so they will look over the brakes, derailleur, crank and rear cassette too. Bike will be ok. Right hip has a huge contusion and road rash, road rash on the right arm and my right wrist hurts. Good news is that the recently broken left wrist of all good now and healing well. Wrist and hip are a concern but the body should heal too. Everyone else seemed to make it home safely from the Strava posts and texts I received. Fun Sunday Recovery ride, finish not so good.